Powell Realty, Inc. was one of the highest producing real estate companies in the Juneau area. 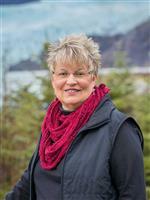 For years Powell Realty, Inc. earned the respect of homeowners in Juneau and Southeast Alaska by offering professional service to each and every customer and client. The dedicated real estate professionals worked together to make a powerful sales force. Powell Realty, Inc. was founded by Janie Bee Powell, and after she retired, her daughter, Honey Bee Anderson, took on the position of Broker for several years. Realizing that her love for the business was in the area of helping clients buy or sell a home, she decided to close the business and join the realtors at Latitude 58 Real Estate Group as Associate Broker so she could concentrate more on her clients. Whether you are new to the market or an experienced investor, we at Latitude 58 Real Estate Group have the expertise, proven track record, and resources to help you achieve your real estate goals. We are committed to serving you with honesty and integrity. We stand committed to these ideals because we're not in it for the fast sale ... we want you to be our client FOR LIFE!